Android TV welcomes FreeAir.tv and CloudAntenna with a slick new material design. There are more and more choices for you to watch and record Live TV with CloudAntenna. 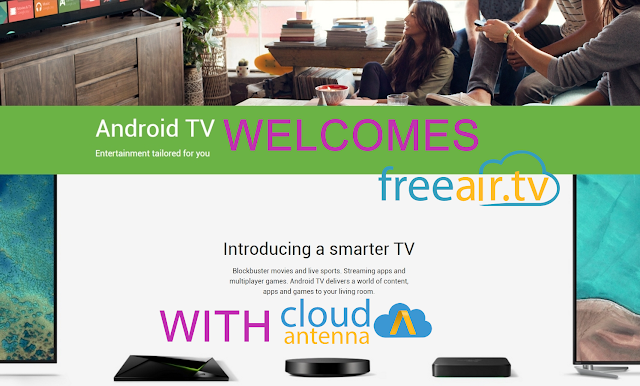 Android TV meets CloudAntenna - they got married and live happily ever after. FreeAir.tv gives you one more option to stream Live TV content on the big screen. Install it here via Viaway app and watch CloudAntenna on Android TV. Watch and record your local Live TV with FreeAir.tv service and CloudAntenna. No more paying to watch your favorite TV shows. In addition, FreeAir.tv via Viaway lets you watch over 1,000 live & on-demand TV channels; 100,000 films and TV shows; 100,000 free video and audio podcasts; 50,000 free Internet radio choices from around the world! Build your own library with features like Favorites, Queue, Download and History. Everything you browse, search, bookmark, or add to Favorites and Queue appears on all of your devices. Download free content and play it offline. Watch a great selection of English, Russian, Ukrainian, French, German, Italian, Romanian, Turkish and many other languages. Like its competitors, Roku3, Google Chromestick, it’s fairly easy to set up and simple to use. There are a lot of options for your new Android TV. It comes built in with new models in 2015 and on, or you can get a stand alone player. Visit Android TV for more details.